Relatively large, adult Weddell seals are on average, 3 metres long and weigh between 400 and 500kg. They are characterised by their dappled grey and black fur on their backs with a mostly white under-belly. They are fairly coastal marine mammals with a circumpolar distribution and only stay around fast ice, which they live under. They head out only 15–20 km into the Southern Ocean to feed. Weddell seals come out onto the fast-ice to rest and moult, and for females to give birth. Weddell seals live the furthest south of any mammal. The best places to see them are Bouvet Island, the Antarctic Peninsula, Ross Sea, Weddell Sea and South Georgia. The most ideal time to visit Antarctica to see Weddell Seals is breeding season. This is usually October just before the height of summer when they give birth and are out on the ice. Contrary to their name, Crabeater seals don’t actually eat crabs; rather they feed primarily on krill and small fish. Smaller than Weddell seals, Crabeater seals have slender bodies and long snouts weighing on average 400kg. Their fur is usually dark brown becoming light brown/blonde in summer. They spend the majority of their time on the pack ice that surrounds Antarctica, only feeding in the surrounding waters. They have an estimated population of roughly 15 million. The Crabeater Seal has the largest population in the Southern Ocean. The best time of year to see Crabeater seals is September – December, during their breeding season. They’re widely distributed across the Antarctic Circle, Antarctic Peninsula, Ross Sea and Weddell Sea. The name “Elephant seal” is derived from the large trunk like nose of males used to make loud roaring noises particularly during mating season. The size difference between the male and female Elephant Seals is huge. Males are roughly three times the size of their female counterparts. Adult males on average weigh 3000kg while females only weigh 300-900kg on average. Surprisingly, despite their large size, elephant seals are remarkable divers and can stay submerged for up to 2 hours. Impressively, they can cover distances of over 1500m. Usually their dives last for approximately 30 minutes, reaching depths between 300m and 800m. If you want to see Elephant seals, the best regions to visit are Bouvet Island, South Orkney Islands, South Sandwich Islands, Antarctic Peninsula, South Shetland Islands, Ross Sea, the Falkland Islands and South Georgia. Prime time of the year to see them is the Antarctic summer, when their out on the ice and the females have already given birth, usually around November – December. During winter you probably wont catch a glimpse as they spend essentially all their time underwater. The smallest of all the seals, fur seals have a thick coat of fur similar to that of a dog, which they rely on for warmth unlike other seals that have layers of fat for warmth. Male fur seals only weigh around 200kg and females 40kg. There are a few sub species of fur seal, including the most commonly found in Antarctica: the Antarctic fur seal and sub-Antarctic fur seal. The best regions to see them are the South Sandwich Islands, Falkland Islands and South Georgia. The best time to see fur seals is during breeding season, when they gather in large numbers on shore. Male fur seals, known as bulls, establish territories and gather harems of up to 40 females, battling their rivals to establish dominance. The females give birth during this breeding season, then mate again just a few days later. They return the year after to give birth to a single pup after a nearly yearlong pregnancy, and mate once again and continue the cycle. Breeding season is typically November to Early January. Roughly the same size as Weddell seals; Ross seals’ coats are medium brown on their backs and silvery grey on their underbelly with brown streaks along their necks. Their mouth is relatively small with needle-like teeth that are well suited to catching slippery prey like squid and other fish underwater. Ross seals are only found in Antarctic waters. Their extreme location and isolated distribution results in rare sightings. Because of this, they have not been studied as much as other seals. Therefore, a lot is still unknown about this antarctic seal species. Its believed that like other seals, their breeding season is during summer. 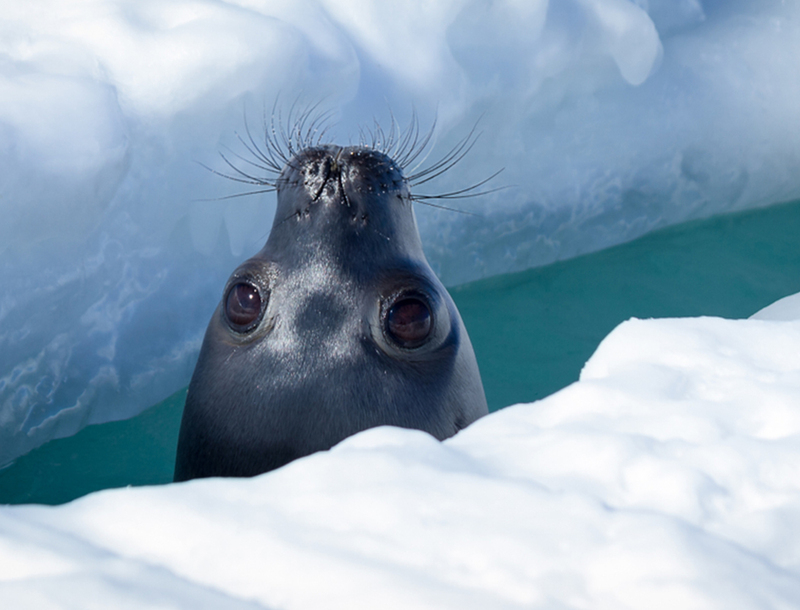 Between November and January Ross Seals can be found in the Antarctic waters in areas with consolidated pack ice. Easily identifiable due to the pattern on their skin, similar to that of an actual leopard, Leopard seals have a grey coat rather than a golden one. The resemblance between the two animals goes further than just their coat; Leopard seals are fierce predators and are the only seal that feeds not only on krill and fish but also warm blooded prey like other seals. In addition, they also eat penguins; they lurk underwater near ice shelves and capture them as they’re diving into the water. They are fairly solitary mammals much like Ross seals and inhabit the pack ice surrounding the Antarctic continent. The Antarctic Peninsula, Ross Sea, Weddell Sea, Falkland Islands and South Georgia are the best places to see Leopard seals. Although they are extremely solitary, they do come together to mate during breeding season (November – March), which is also the best time to see them.